• SORRY, class is full To be placed on waiting list, please send in registration & deposit. If space does not become available, a full refund will be issued. This workshop begins with an intense study in the “creation of line(s) and their spatial relationships” when grouped together with other line(s). All lines will be cut freehand while sharpening one’s eye to stronger proportions. These initial exercises will be done in solid black and solid white. Many small sewn-together compositions will be created. 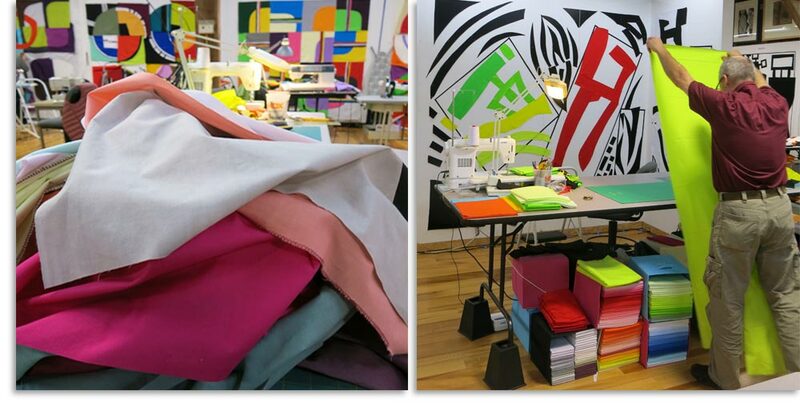 It is hoped that participants will begin to see line as a very important element in quilt-making. Afterwards, this workshop will begin to address other kinds of geometric shapes such as curves and circles in machine-pieced compositions while moving into color and more degrees of values. These new design exercises will investigate evermore sophisticated relationships within a composition. All work will be done in direct machine-piecing using a broad range of solid colors (commercial or hand-dyed). NOTE: Marbled fabrics are not appropriate for this class nor are splotchy hand-dyed fabrics. Students will be given timed exercises that explore classical design concerns such as COLOR, VALUE, PROPORTION, SHAPE, CURVES, CIRCLES, AND LINE RELATIONSHIPS. Lots of SEED IDEAS will be GENERATED. An energizing and thought-provoking (different from those in PART I) group of design exercises has been developed for this new workshop with the intention of strengthening one’s understanding and practice of figure/ground composition. Students will work freehand, cutting by eye all the parts of each compositional exercise while learning to better engineer the construction of a composition. Lines, shapes, and curves will be used to develop geometric configurations. There will be a STRONG EMPHASIS on geometric LINE AND SHAPE CONFIGURATIONS…plus…the USE of FLAT & GLOWING COLORS/VALUES. 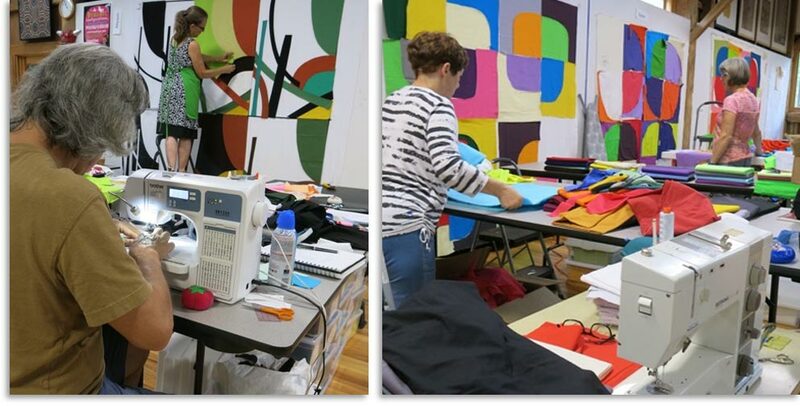 In this workshop, a variety of sewn-together compositions will be created that will incorporate percentages of FLAT & GLOWING COLORS/VALUES making it very important that each student bring appropriate fabrics. Fabrics of choice will be a broad palette of hand-dyed or commercial solids and values. NOTE: Marbled fabrics are not appropriate for this class nor are splotchy hand-dyed fabrics. All sewing will be done in direct machine-piecing. Students will be given TIMED EXERCISES that explore classical design concerns such as COLOR, VALUE, PROPORTION, SHAPE, CURVES and LINE RELATIONSHIPS. SEED IDEAS will be GENERATED that could be used for working-in-a-series. One-on-one and group critiques will be integrated into the class. • MAKE SURE YOU BRING A GOOD SKETCHBOOK (not a yellow lined pad of paper), DIGITAL CAMERA and SMALL PRINTER!!! • Do not come with an agenda! Be open to experimentation and working quickly! • SOLID COLORS (commercial or hand-dyed) in the widest range you can afford to bring & be sure to include both flat & glowing colors - 80 to 100 different colors. We will use a lot of solid colors so bring a good range that includes darks, medium and light values of Browns, Blues, Greens, Reds, Golds, Yellows, Oranges, Purples, Violets, Etc. • Please wash and shrink all fabrics! No need to iron though if you fold at end of drying cycle. • Please bring the glowing version … AND … the flat version of as many colors as possible. • We will use everything listed above so do not decide to leave anything out! • Bring enough variety so you are not hamstrung! • Do not bring prints. • Please bring the glowing version… AND… the flat version of as many colors as possible. • Remember that ANY COLOR … and … ANY VALUE of ANY COLOR can be GLOWING or FLAT. GLOWING colors: Are colors that are mixed with yellow which creates a glowing effect radiating off the surface. FLAT colors: Are colors that are mixed with black which increases the dullness, creating a subdued and flat sensibility to the surface. There is absolutely no glow radiating off the surface. 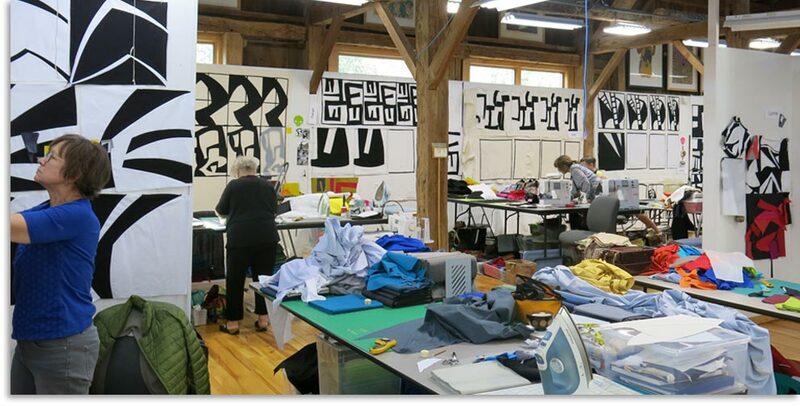 • This brand new 10-day class has been specifically developed for students desirous of working in a series in order to explore one idea in depth using machine-piecing techniques. 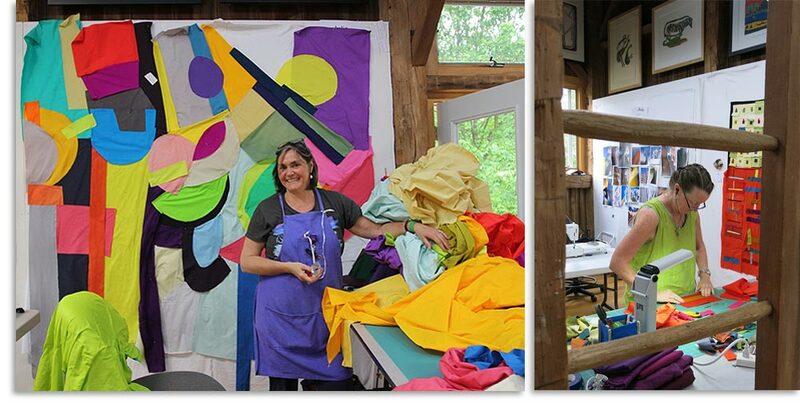 This workshop is intended for anyone who wants to begin or who has begun to develop a group of quilts that significantly relate one to the other in concept, composition, figure/ground relationships, use of motifs, scale, use of color, use of surface design fabrics, etc. This 10-day workshop will accommodate any of the following three approaches. Registered students must email me by August 20, 2018, telling me which APPROACH below they plan to follow. Approach #1: The student begins a series in fabric at home and adds to this series exploring new territory during the 10-days. Size of works is up to the student. Help and critiquing will be offered as wanted. ***For this approach, students will be in charge of the fabric selection they bring to class knowing that whatever they bring should support what they hope to achieve. Approach #2: The student comes prepared to class with initial ideas only - perhaps as sketches in sketchbook or worked up as paper collages. 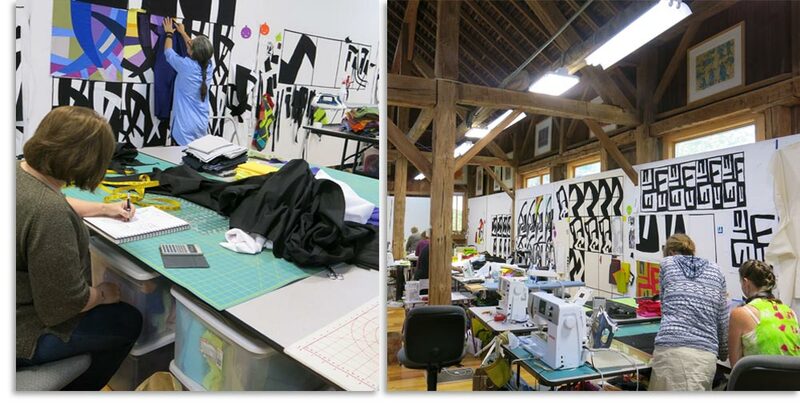 Once in class the student begins creating a group of fabric sketches or small pieced compositions, experimenting with these ideas that could possibly become a series. Help and critiquing will be offered as wanted. ***For this approach, students will be in charge of the fabric selection they bring to class knowing that whatever they bring should support what they hope to achieve. Approach #3: A group of formal exercises will be presented to loosen up creative energy. These exercises will be done using machine-piecing and fabric and will activate imagination and thought processes towards developing a series. Help and critiquing will be offered as wanted. ***For this approach, students will be in charge of the fabric selection they bring to class knowing that whatever they bring should support what they hope to achieve. If wanting to do APPROACH #3, then it will be imperative to bring 6-8 yards of black and 6-8 yards of white. I have no way of knowing exactly how much black and white will be used but both will be well stocked. Each student must come prepared to give a well-organized, thoughtful talk about their work. This talk can either be built around 6-10 or more actual quilts or be presented as a digital talk. This articulate (5-8 minutes maximum) presentation must include a reference about future goals and why one is taking this class. The quality of the presentation should be as well done as possible as though asked to present at a museum to an audience. 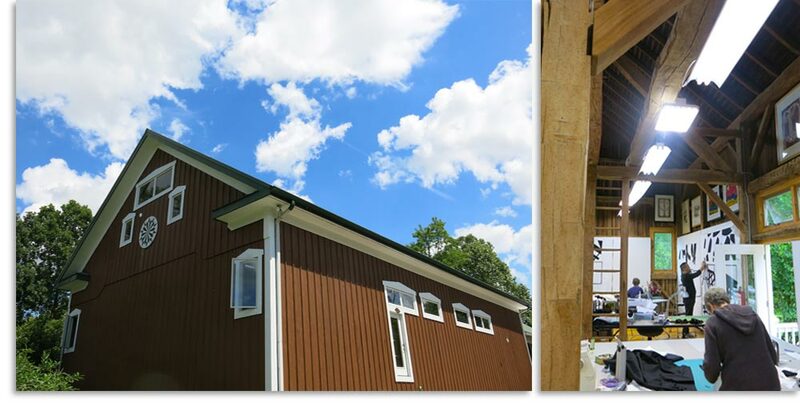 The Crow Timber Frame Barn provides use of a digital projector connected to a laptop. • SOLID OPAQUE COLORS (wide range in light, medium light, medium, medium dark, dark values so you can be free to work) - reds, pinks, blues, teals, greens, limes, violets, browns, yellows, golds, oranges, purples, maroons, turquoises, rusts, etc. Working in color does not mean only using BOLD colors or HOT colors; working in color means learning to be versatile in all types of colors. Overall during the class, we will use many solid colors, but still.... please bring the requested prints. When choosing both solid colors and prints to bring to class, be sure to bring both glowing (warm) and flat (cool) tones. Many students arrive with their own hand-dyed solids or stacks they have purchased from other dyers. By all means, bring hand-dyed if you want but they need to be opaque and not have multiple values swimming across them ... meaning white or light splotches on dark colors unless these are being used purposefully in works-in-a-series. Flat solids (dyed commercially) are equally acceptable. I cannot specifically tell you to only bring 1 yard cuts of each color because I know we will be using at least a yard or more of some to many colors depending on each student’s color preferences. If you bring a yard of each – say 5 blues, 5 reds, 5 yellows, 5 greens, etc., but one each in light values, medium light values, medium values, medium dark values, & dark values, that would be better than not having enough. So bring 1 yard of as many colors as you can afford and shorter lengths for the rest.